Pale Stormcloak Camp is a Stormcloak camp located in the Pale, on the south shore of Lake Yorgrim, southeast of Bronze Water Cave. 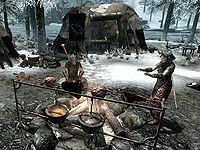 This camp will only be present if the Imperial Legion hold the Pale and Dawnstar, whether through martial might or via the negotiation during Season Unending. The camp is commanded by Frorkmar Banner-Torn, except during the related quest to take over the Pale, when Galmar Stone-Fist will take over. Like most other military encampments, a quartermaster can be found here. The camp is built around a campfire with a cooking spit hanging over it. Around the fire are three small one-man tents containing unowned hay piles. If you have completed Joining the Legion, the Stormcloak soldiers will inform you that "You're not welcome here" and warn you to leave. However as long as you haven't joined the Legion or are allied with the Stormcloaks you will be able to trade with the quartermaster, who buys and sells weapons, armor, ores and ingots. You will also be able to use any of the hay piles in the three small tents around the camp to sleep on. Northwest of the fire is the commander's sleeping quarters, which consist of a large tent containing an owned bed roll, an end table and an unlocked chest containing minor loot. To the left of this is a quartermaster's tent with a long wooden table in front, a grindstone to the left and a workbench and an anvil to the right. On the table and inside the tent are a selection of iron and steel weapons and armor, all of which are marked as owned, and taking them is considered stealing. To the right of the commander's quarters is a wood chopping block, with the command tent further to the right. It contains a tactical map of Skyrim laid out over a wooden table, showing the progress of the civil war, where the commander spends most of their time studying the map. Also in the tent is an empty round wooden table, while in front of the tent is a banner hanging from a post with the bear's head emblem of Windhelm on it. Northeast of the campfire is the hospital tent containing three more hay piles, two of which are occupied with sick or injured Stormcloak soldiers, a low table with a random potion of healing and a random potion of health on top, To the left of the tent is a table with a built-in alchemy lab, while to the right are some barrels of food. There are two iron ore veins in the area; one to the northwest, by the shore and the other to the southeast. The are two clay depositsHF nearby; one to the northwest, near an iron ore vein and the other to the east. The quartermaster may be missing or tagged as a normal soldier even though he spends his time using the anvil, etc. this means you are unable to buy or sell items at this camp as he lacks the speech options. ? This page was last modified on 27 May 2018, at 12:32.